Cafe Scientifique is a place where for the price of a cup of coffee or a glass of wine, anyone can come to explore the latest ideas in science and technology. Meetings typically take place in cafes, bars, community buildings, restaurants and even theatres, but always outside a traditional academic context. 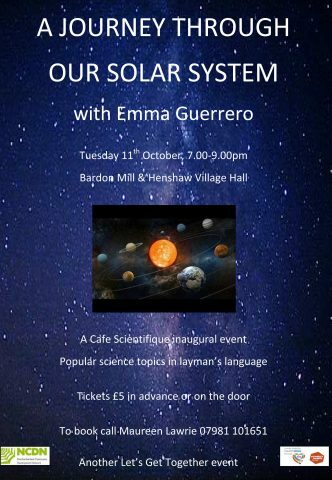 On Tuesday 11th October, Emma Guerrera will host a fascinating session taking us on a journey through our solar system.